At the end of each October the Seattle Weavers' Guild hosts its annual sale. Among the goods offered for sale are many beautiful handwoven scarves. This one, by Ann Norton, used differential shrinkage to acheive its lovely texture. It was woven on a soft warp of 14/2 merino wool (which would shrink a lot) and 8/2 tencel (which would not shrink). 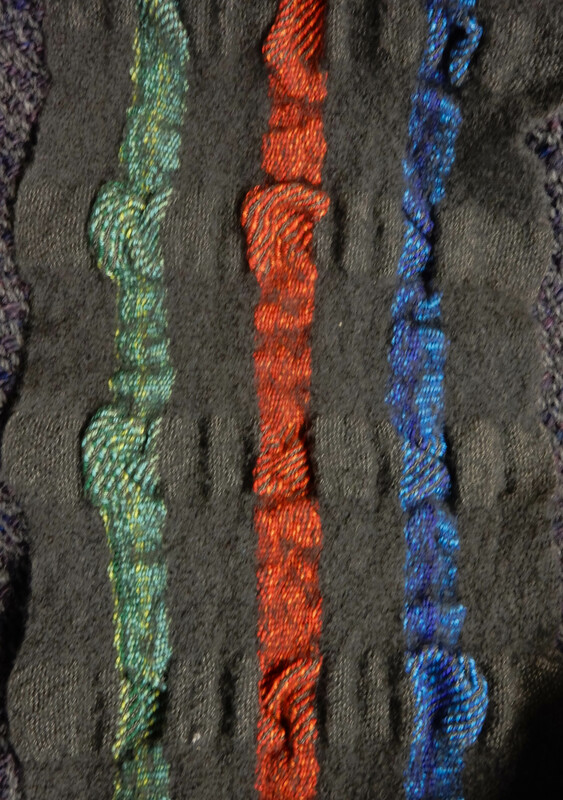 The sett for the wool was 12 epi, threaded to a plain weave and the colored stripes were sett at 24 epi threaded in a straight twill. She used HOT water with dish soap to shrink (felt) it and was careful not to over felt. The colors were inspired by a photo taken by a friend of a Costa Rican tree frog.